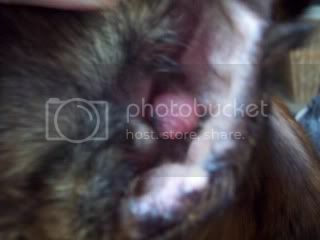 Remy goes in to have his ear bump / thingy removed tomorrow ( I refuse to call it a tumor) . This is the first pic I took of the bump . This is today . You can kinda see how it breaks open then grows out from where it splits . The second bump is not growing as fast as the first one , it is to the left of the bottom of the big bump. But you can see that is is a little bigger . that all goes well tomorrow. Is he bothering it at all? It looks like the placement would be irritating. Sending good vibes to ur baby for tomorrow. Is he bothering it at all? It looks like the placement would be irritating. He has been wearing an e-collar at night . During the day he is doing a lot of head shaking and trying to scratch it . Oh man! That thing looks painful! Sending lots of easy surgery vibes and really hope it's nothing. poor dude. How wierd. Let us know how it goes and if they figure out what it is. Hoping surgery goes well and that it is nothing serious. Keep us posted! they can get clean margins and it's nothing serious. She already said it will be impossible to get clean margins . 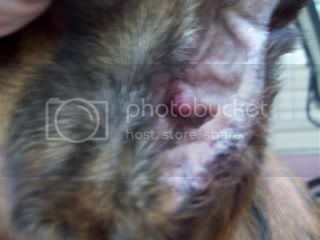 We will have it biopsied and go from there . I hope it's nothing serious, just a benign histio that's being persistant. Hoping it's just a bump and nothing more. Thinking of you today, Missi! Hope the boy is home and resting comfortably. I am hoping for nothing more then a cycst!